Connie spent more than 20 years serving the Hurricanes athletic department behind the scenes in ways that most Canes never see, but the games couldn't happen without her. She served as the Associate Athletic Director for Internal Operations and Senior Women's Administrator, overseeing the production of all home athletic events, including conference and NCAA championships. She was in charge of scheduling for football, and supervised all Olympic sports at Miami. 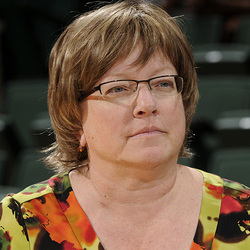 Appointed Senior Women's Administrator in 1998, she oversaw the introduction of women's soccer and volleyball at UM, and worked to promote women's sports in the Miami area. Nickel served as the adminstrative chair for the Student Athletic Advisory Committee and was the advisor to the cheerleaders, dance team and mascot, Sebastian the Ibis. A native of Bay City, Michigan, she was inducted into the Iron Arrow Honor Society, the highest honor one can attain at the University, in 2000.